Need to make a quick buck and don’t care about conducting business that’s either illegal or—at the very least—ethically reprehensible? Love the rush you get after screwing over some common sucker with a good con? Here’s an idea: buy a few pot-bellied piglets from a senile farmer who doesn’t ask questions, wrap a pretty pink bow around it, and sell it on Craigslist as “Mildred, a teacup pig in need of a loving home.” By the time friendly old Mildred begins revealing her true size, you’ll be hawking pot-bellied piglets to teacup-loving saps a few towns over. They were actually Vietnamese Pot-Bellied Pigs, which typically grow to 200 pounds, unlike teacup pigs that top out at about 60 pounds. “People noticed their rapid growth and said, ‘They’re not micro-pigs,’ but I wouldn’t listen to them,” Byrne, 47, told Caters News. 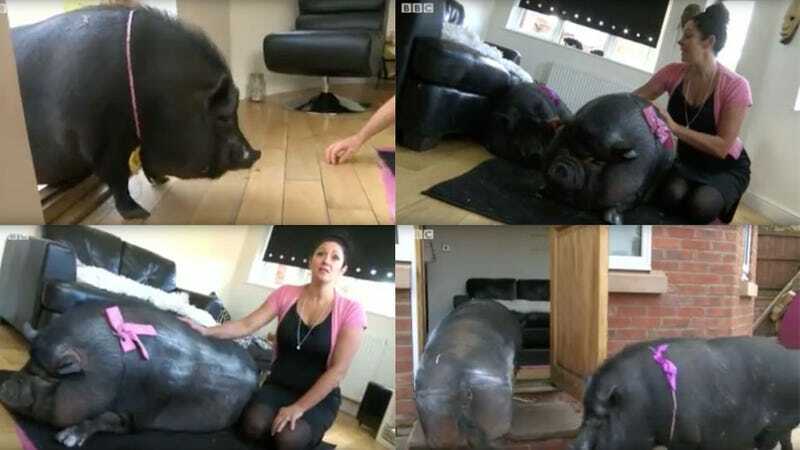 In BBC report from several years ago, Byrne shares that she and her husband Dave bought Molly, another pot-bellied pig, to give Meeka a “friend.” They appear to be a happy family, though Dave says he’s often annoyed by their grunts when he’s trying to watch the telly. To find pot-bellied piglets for sale in your area, click here.